Jocelyn Braxton Armstrong is a ceramic artist whose sculptures have a fresh sophistication and modern aesthetic that link fine art with craft before devoting herself full-time to ceramics in 2001, Ms. Armstrong spent nearly 20 years as a freelance fashion stylist/editor in Manhattan. Since then, she has developed a signature technique of building black and white porcelain ceramic sculptures to look delicately stitched together. Ms. Armstrong’s talent has been recognized and her work critically acclaimed. She received an Artist Fellowship Grant from the Connecticut Commission on Culture and Tourism in 2008, and was granted prestigious Emerging Artist Awards from American Style Magazine in 2008, Ceramics Monthly in 2007, and The Aldrich Contemporary Art Museum in 2005. She won the First Prize in Sculpture in 2008 and 2006 during the "Annual Art of the Northeast USA Exhibition” at the Silvermine Guild Arts Center (New Canaan, CT) and at the "Bruce Museum Arts Festival” in 2013 (Greenwich, CT). 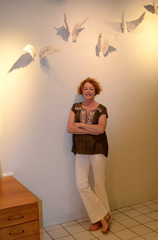 Her porcelain sculptures have been exhibited regionally and nationally at venues including Fuller Craft Museum (Brockton, MA), San Angelo Museum of Art (San Angelo, TX), Peninsula Museum of Art (Belmont, CA), Lincoln Arts & Cultural Foundation (Lincoln, CA), Mesa Contemporary Arts (Mesa, AZ), Wayne Art Center (Wayne, PA), Annmarie Sculpture Garden & Arts Center (Dowell, MD), Sherrie Gallerie (Columbus, OH), BWAC Gallery (Red Hook, Brooklyn, NY), Phoenix Gallery (NYC) Visual Arts Center of New Jersey (Summit, NJ), Rockland Center for the Arts (West Nyack, NY), Clay Art Center (Port Chester, NY), Westport Arts Center (Westport, CT), Artspace (New Haven,CT) and The Aldrich Contemporary Art Museum (Ridgefield, CT). Her work is included in Brooklyn Museum's Elizabeth A. Sackler Center for Feminist Art: Feminist Art Base (Brooklyn, NY).